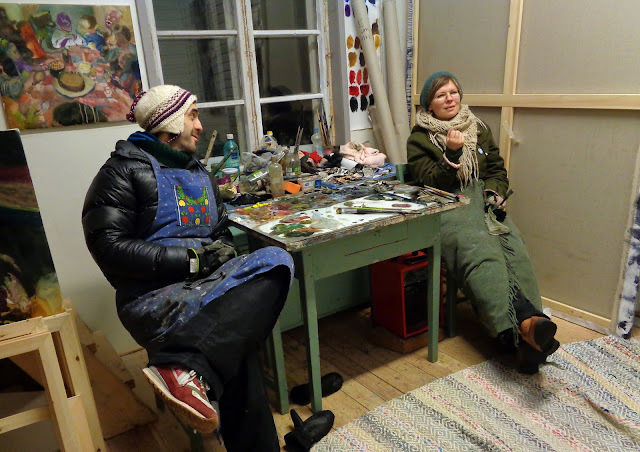 Raisa Raekallio and Misha del Val are an artist couple working together in drawing, painting, performance art and comic, based in Levi (Sirkka), Lapland, Finland. Raisa and Misha started their working collaboration in 2013 following an uncannily similar taste for art, a devotion for the forest and a deplorable sense of humor. The artist couple's new artistic project in collaboration 'Galactic Refugees' (2019), comprises the production of a new body of paintings and ceramic works based on a fantastical scenario, where outer-space beings seek asylum in our planet, fleeing havoc in their own distant homelands. This scenario, which serves as a departing point and general conceptual framework for the artistic project, mirrors the precarious movement of masses of people in a desperate search for a safe place to live in our present-day world. The works -through a playful, poetic, non-documentary language of hand-made objects- pose questions on how we personally relate to the current international refugee crisis and the responses/attitudes that these migrations generate within our societies. Raisa and Misha’s unique approach to making paintings -sharing the brushes, the canvas, the walls and working together at the same time on the same surface- calls upon the artists for an attitude of openness, respect, trust and self-assurance. 'We depend on each other for the success of the enterprise.' The dynamics of this collaboration are intimately connected with the qualities ‘Galactic Refugees’ sets up to question in the broader context of our society. 2017 'The Misgivings of Perfect Love' Aitta-studio, Sirkka, Finland.